There is no polite way to put this. She is a little burping and farting machine. Bella was never gassy at all, she was many things but gassy was not one of them! Gas, wind, whatever you prefer to call it is actually quite rare in EBF (exclusively breastfed) babies and it was this that prompted me to look into the cause behind Rosie’s gas problem. She has a complete lip tie which means she has a shallow latch enabling air to be taken in when feeding. Mostly this means unladylike belches, many farts and quite a bit of posseting. Apart from the change of clothes pretty manageable. But then there are the other times when it does become a problem. Trapped wind; uncomfortable as an adult, excruciatingly painful for a baby. All those who have had dealings with windy babies know all too well the red faced screams as they arch their backs, pull up their legs as the bubbles of air inside them cause a whole lot of pain. So it was with interest when I was contacted by Infacol to try out some baby massage in order to see if it helped with Rosie’s wind problem. I tried baby massage with Bella but that girl hated it, hated being naked, didn’t like being massaged so I had sort of dismissed it for Rosie. I fell into that trap that many parents do of assuming our children will be the same in likes, temperament etc. So out came the towel, downloaded the info, dug out the massage oil from my maternity kit and off we go! Now at this point I must stress that the items I use are what works for us and may not be suitable for everyone, if using oil for massage always do a small test patch on yourself and your baby 24 hours before the intended massage in case of reaction. We are using Sweet Almond base oil for our massage and only a tiny amount. This is an oil I have used on myself during pregnancy and on Rosie’s dry skin after she was born. We both had eczema, mine the more severe, so it was key to use an oil that would not react. I started with the anti-colic exercises as Rosie was displaying signs of trapped wind when we tried these techniques. They seemed strange at first but Rosie loved them, out of all the other massage types (apart from the shoulder one, that was her absolute favourite!) the anti-colic trio were the biggest hits! Chest: Rosie kept grabbing my hands during the chest massage. Note I have removed my rings to avoid injury. Might work better in an older baby, couldn’t stop Rosie grabbing me in this one! By far and away Rosie’s favourite. Notice how she is pushing up against my fingertips as I do this massage. Couldn’t get a picture of me doing this with Rosie but this is her after producing a HUGE burp during the technique! A happy, wind free baby who then slept for over an hour, previously unheard of during the day! The information sheet is simple and easy to follow, giving clear instruction on each technique and how long to perform the massage for. I can see these massages becoming part of our nightly routine before bed in order to help Rosie remain pain free. I plan to show my husband these techniques tonight so we can both enjoy the time massaging Rosie. 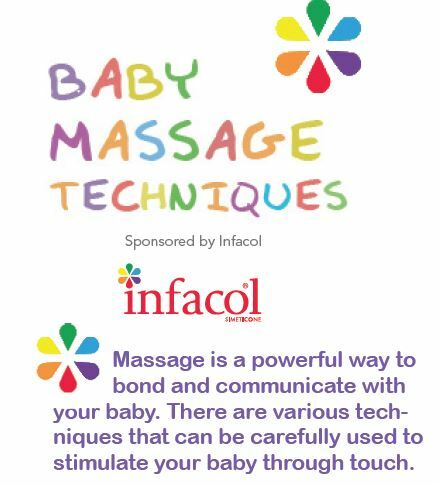 Infacol are the market leaders in colic relief and have set up a virtual colic surgery with and expert midwife on hand to advise on the treatment of colic in babies. Why not check it out today?